The start of this new year has been especially exciting because 2015 will be a year of big change for me. Having been living in Western Australia for almost four years, this year (next month, no less!) I'm moving to Queensland. Firstly, apologies to friends in Europe. I am are aware this is not the return to Europe you have been asking about! Those without much experience of Australia may think ‘big deal, moving within Australia. How different can it be?’ and having previously lived in other countries, I can understand this. It wasn’t until I had lived in Australia for a few months that I truly understood distance, from an Australian perspective. In Europe, a four-hour car trip can take you through four different countries. In parts of Australia it may only take you to the next town. To give you an idea of the size of Australia, the drive to Queensland will take around five days, driving 10 hours each day on largely empty highways. Where have we been living? For almost four years I have been based in Esperance, in the southeast corner of Western Australia’s south coast. Esperance is a small farming community that exists in splendid isolation on a spectacular coastline. It is truly remote and feels like a well kept secret at the end of the earth. This extreme isolation makes Esperance unique and it has been a fascinating place to experience. I have been humbled by the generosity of local people that seem to be endlessly raising money for worthy causes, even extending to visitors that have run into trouble while in town. Living so remotely also makes Esperance residents very self-sufficient. The town has an entire volunteer centre dedicated to managing the many locals that volunteer their spare time to benefit the community, such as signing up as emergency responders at the ambulance centre and bush fire brigades, organising sport clubs (of which there are many) and assisting at homes for the elderly. Esperance is a quiet place, where it is easy to avoid many of the usual stresses of modern life, like commuting, traffic and parking problems. Esperance’s remoteness is commonly considered one of its greatest features as crowds are unusual and you can often have one of the numerous breathtaking beaches completely to yourself. However, the isolation, especially when it becomes your daily life, is not without its challenges. From my 'keen traveller' perspective (it's all about me! ), the expensive flights to Perth, that rarely connect well to ongoing flights, present the most irritating hurdle. This has not only restricted travel opportunities but has also significantly reduced the contact I have had with friends and family over recent years. I have prioritised travel and have still managed to visit family and reach a variety of interesting places while living here, but it has sometimes been awkward to arrange due to timings and has consistently been expensive. During the years here I have explored the local area extensively. I have enjoyed picnics on the whitest sand, next to crystal clear water, and accompanied by cheeky kangaroos looking to steal a snack. I have seen the amazing wildflowers the area is famous for and enjoyed the remarkable colour of other native flora during the different seasons (the bright yellow ‘Christmas Trees’ that come out in December and January are my favourite). I have watched whales swim through Esperance Bay with their calves and met friendly sea lions on the beach. Spare time has been spent scuba diving, fishing, four-wheel-driving along the remarkable beaches, and camping in some truly remote wilderness areas and beautiful national parks. I have also visited some of Esperance’s local artisans such as the various artists’ studios and local fish leather tannery, and some of the quirkier attractions such as the local replica of Stonehenge. 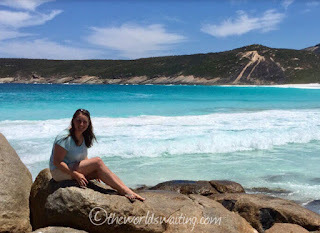 Esperance is a unique and fantastic place to spend a few days exploring and relaxing. It is certainly a paradise for those wanting first-hand experiences of wild, rugged scenery and the great outdoors. I am sure I have experienced the best of everything Esperance has to offer and that is partly why it is time to leave. Esperance is a small regional community, and while it is one of many small regional communities in Australia, I am looking forward to experiencing life in a busier part of Australia, as well as being nearer family and friends. I leave Esperance with several new friends (many threatening to visit us in Queensland, including Karen in the photo above, who is a real troublemaker!) lots of fond memories, and looking forward to the next chapter. I'm not yet sure exactly where I will next call home, but will keep you posted!